Is it really possible that August is coming to an end? How can this be? It’s true that fall is my favorite season and though I do enjoy it, this year I have zero desire for summer to end. In past years, I’ve been known to start yearning for fall in early June or once, late May. But not this year. I have been loving the heck out of this summer! I’m sure that two extremely awesome trips and generally great weather have played no small role in my feelings. I’m just not quite ready to give in to pumpkin and apples yet. 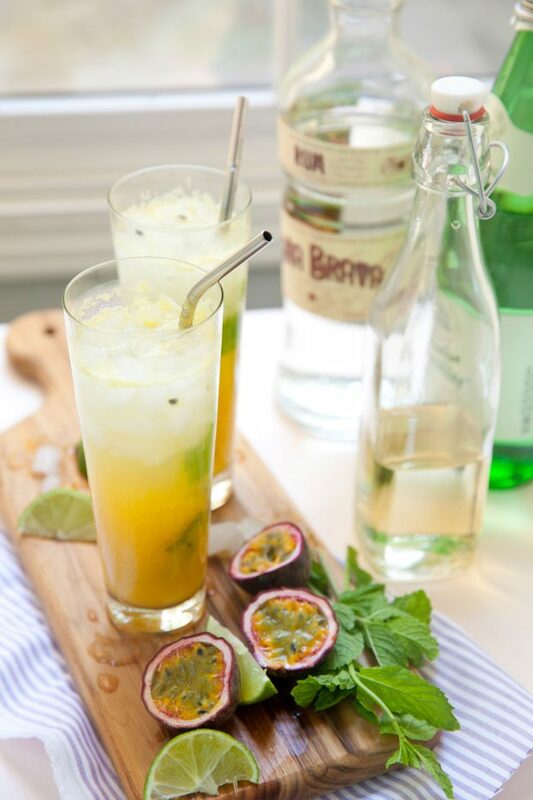 These passion fruit mojitos are one way for me to keep summer going strong. This recipe is another that was inspired by our trip to Italy – passion mojitos were another lovely drink I sipped poolside in Amalfi. (I swear, I DO have other recipe inspiration from Italy beyond cocktails but many of those foods are on the heavier, comfort food side of the spectrum and I haven’t been in the mood for them yet. See above re: summatime.) Passion fruit is way up at the top of my list of favorite flavors/ingredients, and I order practically anything that includes it when I see it on a menu. 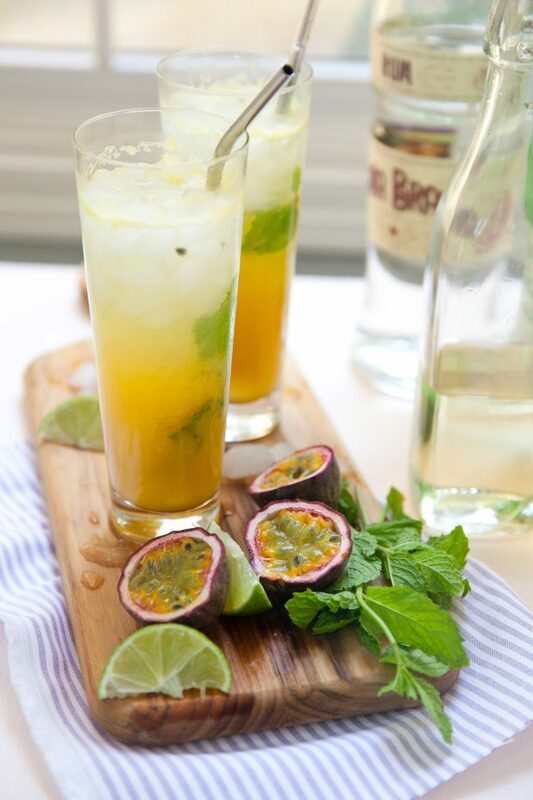 These mojitos are an excellent way to showcase the bright tangy flavor of fresh passion fruit, and if I do say so myself, this version is even better than the original which inspired me in the first place. In a serving glass, combine the lime juice, mint leaves, simple syrup and rum. Muddle together well. Add in the passion fruit juice/pulp and stir to combine. Add crushed ice to fill the glass most of the way. Top off with sparkling water. Garnish with a few passion fruit seeds, if desired. Stir gently with a straw and serve. To make the passion fruit juice/pulp, scoop the inside pulp/seed mixture out of the shells and transfer to a mesh sieve. Stir with a spoon, pressing the juice and pulp through the sieve into a bowl or liquid measuring cup.